SURE, CHARLES BOMBARDIER is a mechanical engineer and a member of the family whose aerospace and transportation company builds jets, trains, and snowmobiles used all over the world. But he’s at his best when he ignores pesky things like budgets, timelines, and contemporary physics. Since 2013, he’s run a blog cataloging more than 200 concepts, each a fantastic, farfetched new way for people to travel through land, air, water, and space. His ideas are most certainly out there, but it’s Bombardier’s sort of creative thinking that keeps us moving forward. 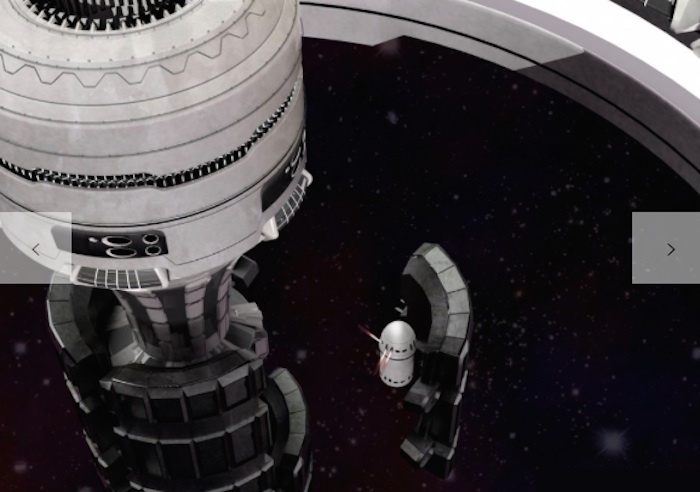 In space, the most expensive portions of travel are speeding up and slowing down. They demand tremendous energy, a problem if you want to move lots of people or cargo around the solar system. That’s why I’ve created the Solar Express, a conceptual space train that would ferry humans, supplies, and minerals between celestial bodies and space stations. Instead of constantly stopping and starting up again, the Solar Express would run non-stop—much like a ski lift—and smaller vessels looking to catch a ride would hop on as it passes by. The Solar Express would be made of six aligned cylinders, each at least 165 feet long and split into four cargo bays. Maintenance robots would swap those containers out as necessary. Rocket boosters would supply the initial acceleration up to one percent of the speed of light, about 1,865 miles per second. 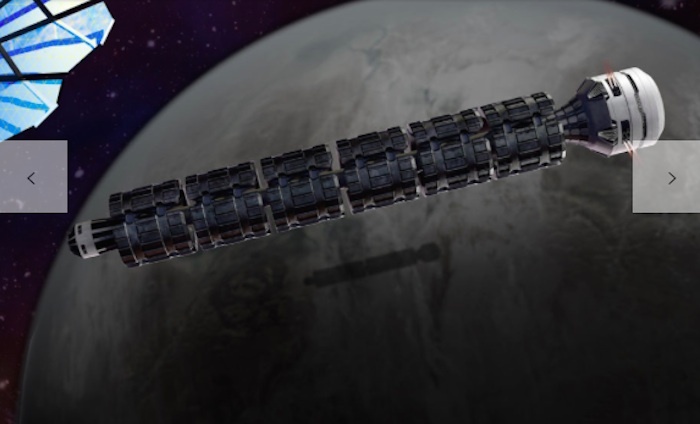 Extra fuel stashed in the train’s core would enable course adjustments, and the train would use the force of gravity to slingshot around planets or moons. So how do you get on this thing? Climb into a mobile cargo bay or other spaceship on whatever planet you’re inhabiting at the moment, and use it to catch up to the Solar Express, then latch on. The faster it’s going, the more expensive it will be to catch it. As you can imagine, the cost per ton is important, much like parcel shipping services. 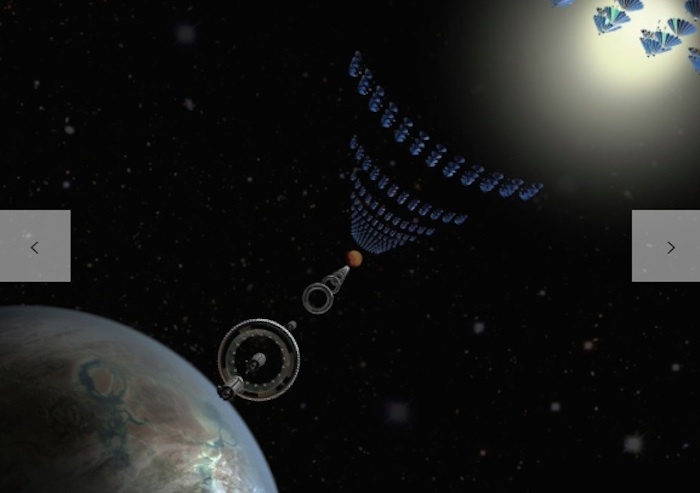 Some Solar Express trains could be used to make large loops (between distant planets), while others would be assigned shorter routes, offering a range of pricing options. 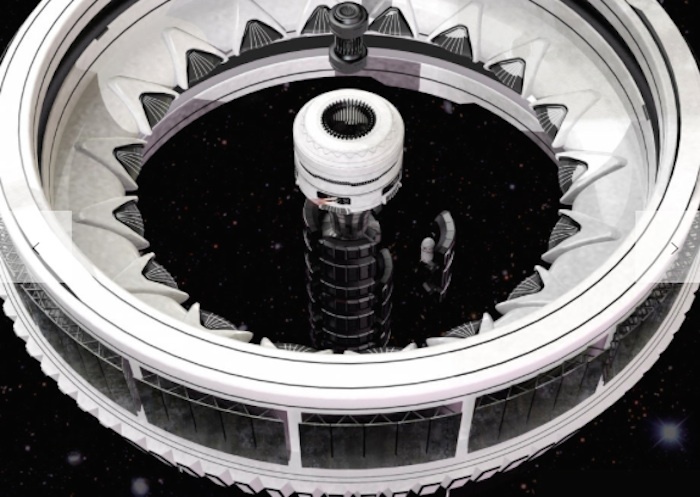 Once aboard, you’ll hang out in a large “space city,” rotating around the longitudinal axis to generate gravity. You’ll enjoy electricity generated by huge solar arrays along the train’s path (transferred over via lasers) and drink water harvested from comets or small moons. You could also use that water to create hydrogen fuel, but ion thrusters would do the bulk of the propulsion. Obviously, there’s a lot to consider here, from the dimensions of the thing to its speed to its control systems. The Solar Express is a basic idea, and I’d like to know how we could improve it. I would like to thank Boris Schwarzer, who created the renderings of the Solar Express. Based in Michigan, Boris is a contractual designer for the Ford Motor Company, and also created the images of the Urban Link driverless electric tuk-tuk and the Kube condo transit system.